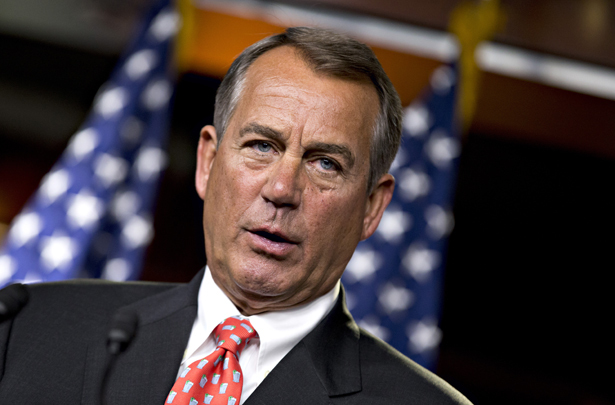 Could John Boehner’s New Immigration Strategist Actually Pass Some Reforms? Becky Tallent’s piecemeal approach to immigration reform may appeal to congressmen, but will it ever appeal to voters? If you don’t live or work in Washington, a chronicle of staffing changes on the Beltway is about as interesting as faraway mild weather or a stranger’s dreams. In other words: not very. But Representative John Boehner announced a new hire last week whose presence in the Speaker’s office implies that immigration reform is still a viable possibility, or at least that Boehner would like it to be. That hire’s name is Becky Tallent and until last week she was the director of immigration policy at the Bipartisan Policy Center. Before that, she was an aide to two Arizonan Republicans who advocated for immigration reform—Senator John McCain and Representative Jim Kolbe. Immigration reform is a notoriously stagnant area of policy—Congress has been trying to get a bill passed since 1996 —and Tallent seems to have a reputation for getting things done. “You don’t hire Becky Tallent if what you want is someone to twiddle her thumbs and just buy you time. You hire Becky to help craft solutions and turn them into law,” Anna Navarro, a former aide to McCain, told MSNBC. Tallent’s approach, based on an op-ed she published in The Christian Science Monitor last month, will likely be piecemeal; she’ll separately tackle border security, new visa requirements, and the status of undocumented residents already living here. “For the House to pass immigration reform, it needs an opportunity to work through its own process, moving smaller, piecemeal bills that members feel they have the opportunity to review and allow their constituents to vet,” Tallent wrote. What she does not say, of course, is that a comprehensive bill would be a political coup for Obama and that is a legacy Republican congressmen do not want to grant him. The Bipartisan Policy Center published a report in August that called for increased border security, a “rigorous” path to citizenship accessible to all undocumented immigrants, more employment-based immigration, and a regulated temporary worker program. But to advocate for these reforms separately is to risk that one or more of them not be passed at all. A multi-step approach to immigration reform has become more widely accepted in Washington. President Obama has said that he would gladly approve of a series of smaller bills rather than a single comprehensive one. “If they want to chop that thing up into five pieces, as long as all five pieces get done, I don’t care what it looks like, as long as it’s actually delivering on those core values that we talk about,” the President has said. A piecemeal approach will invite a dozen different proposals on who can stay and who must go, dictating which families can be spliced across international borders and how. Currently, Representative Eric Cantor and Representative Bob Goodlatte, both Republicans from Virginia, would like to only offer a path to citizenship to young, undocumented immigrants—so-called “Dreamers.” Representative Mike Coffman, a Republican from Colorado, would only offer it to those who enlist in the military. Late last month, President Obama quietly issued a memo allowing for undocumented family members of some military personnel to remain in the country. The President appears to be more frequently exercising his right to make relatively minor administrative adjustments to immigration laws, approaching reform in bits. Yesterday, a group of protesters from the organization We Belong Together gathered on the Hill. Many of the protesters were children who had been separated from parents because of immigration issues. In 2012 alone, the group says, 152,000 children in the US had a parent deported. Two of the protesters, Javier and Angel, are 16-year-old twins and US citizens. They live in Oakland with their father and 9-year-old brother, who are also citizens, while their mother lives in Oaxaca because she’s unable to get a visa. She was detained at the border in 2011 when their family returned to California after a visit to Mexico and she’s had to stay there since. “It’s been hard on my dad,” Angel told me. He and Javier take care of their younger brother; they drop him off and pick him up from school. “He looks at us like parents,” Angel said. There’s also Fast for Families, a coordinated hunger strike to demand a path to citizenship for all undocumented residents. (The Obamas paid hunger strikers a visit over Thanksgiving.) This morning, eight New Jersey activists lay in the snow outside the ICE detention center in Elizabeth blocking all outgoing traffic. “Don’t deport my mama,” they yelled. “Not one more.” (By 9 this morning, all protesters appear to have been arrested.) The surge of activism comes just after the release of new data from the Justice Department showing that immigration prosecutions reached an all-time high in 2013, with new cases being filed against 97,384 defendants. Polls show that a majority of Americans want a comprehensive immigration reform bill that includes all the tenets outlined by Tallent’s former employer, more border security and a path to citizenship. Advocates include business leaders (see Mark Zuckerberg’s recent immigration hackathon), who believe such a bill would be economically advantageous, and religious organizations. Perhaps a piecemeal approach will appeal to Republicans in the House, but can Tallent make it appeal to voters?